Plantronics BackBeat 903+ Review – Ever wish to own a combo of microphone + earphones (not those full-sized big and bulky headphones) to listen to your music and make/receive calls at the same time? We all do and some of us are even using one. What if you can have all that, and more? Wouldn’t that be awesome? 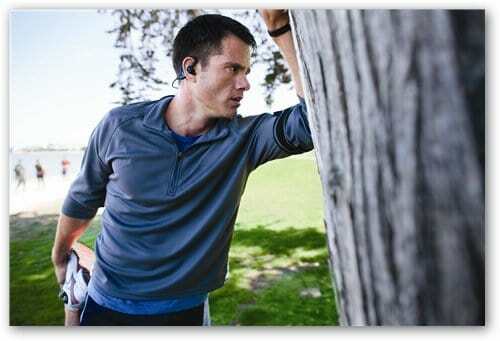 Plantronics latest’ Bluetooth headset, the BackBeat 903+ can handle such tasks, beautifully and wirelessly. It’s compact, it’s comfortable, and it produces an unexpectedly great quality of sound! The BackBeat 903+ looks really great and its design is also quite unique. Plantronics design team actually consists of designers from varied design experience backgrounds such as cars’ designers (BMW) and also many others, which explains the creativity and innovativity behind their product design so far. It also comes with a nice pouch should you need to carry it with you on your journey. 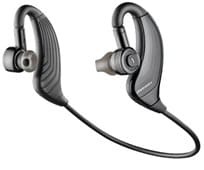 Like the other Plantronics Bluetooth headsets that I’ve reviewed (Voyager PRO UC and M100), the BackBeat 903+ uses gel ear tips compared to the conventional ear buds. I find them as comfortable as ordinary ear buds so nothing to complain here. The BackBeat 903+ ear buds are not round shaped though. They have these unique slopes (like an Aladdin’s lamp) so that they can fit into the ears contour better. It actually works but at the same time, I can’t manage to plant it too deep into my ear canals. As a result, you can still hear the sound from the outside world, for a good reason. Some in-ear earphones completely shut the environment noise off and often people got an accident because of this. I actually almost missed my train home because I couldn’t hear an announcement, thanks to my old noise cancelling earphones that worked too well :) Nevertheless, I still personally prefer the traditional in-ear design because I often listen to a podcast and sometimes I need to pause it when a train passes nearby. This time, the ear hooks are actually part of the body so they blend in pretty well with your ears. Its ruggedized materials are definitely tailored for active lifestyles and it’s also sweat resistant, meaning you can comfortably wear the BackBeat 903+ while you jog or even when you are in the gym. The hooks will also keep the ear buds intact, no matter how hard you run or jump. 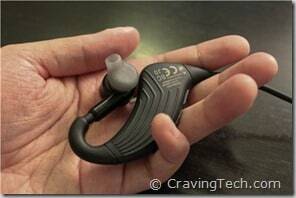 The ear hook swivels are adjustable (also with rotatable ear buds) to securely fit them into everyone’s ears. There are only a few buttons on the BackBeat 903+ and most functions can be done using a combination of presses on these buttons. It may take a while to remember which button presses do which actions, but you’ll get a hang of it in no time. It’s actually a good design as it keeps the BackBeat 903+ compact in size. For example with the power button: press and hold to turn on/off, press once to let you know of the battery time remaining, press longer for Bluetooth pairing. I’m not going to explain which button does what here as you can read the Plantronics BackBeat 903+ User Guide yourself on the Plantronics’ site. The overall experience in using the BackBeat 903+ is really satisfying. 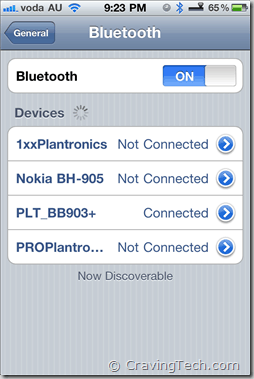 Pairing it with my iPhone 4 is very easy and there are also LED indicators and audible voices/tones when you do certain actions. The audible alerts are not intrusive and never annoy me with too much information. It seems that there is no audible alert for the Bass Boost feature (apart from noticing how your music feels more bass-y). The alert also lets you know when the battery is running low (approximately 30 and 10 minutes before the battery runs out) which is really handy. 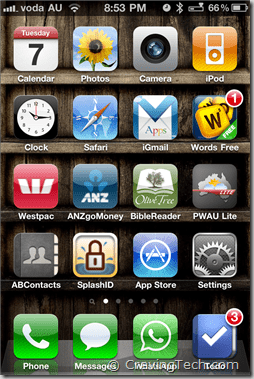 If you own an iPhone, you can even see the battery meter left on the top of the screen. It didn’t normally take too long to fully charge the unit. Plantronics mentioned that the BackBeat 903+ gives roughly 7 hours of talk time and in my experience, it’s days before the battery ever runs out (depends on your usage). I honestly didn’t expect the music quality to be this great. I was amazed at how crystal clear the sound was coming from the BackBeat 903+. The sound is definitely much better than regular earphones or the Apple’s earphones although it may not satisfy the audiophiles. The Bass Boost is not bad too and quite recommended to be enabled when you are listening to music. The BackBeat 903+ does not seem to remember the last Bass Boost setting so I have to turn it back on every time I reconnect the device, but this is not a show stopper. 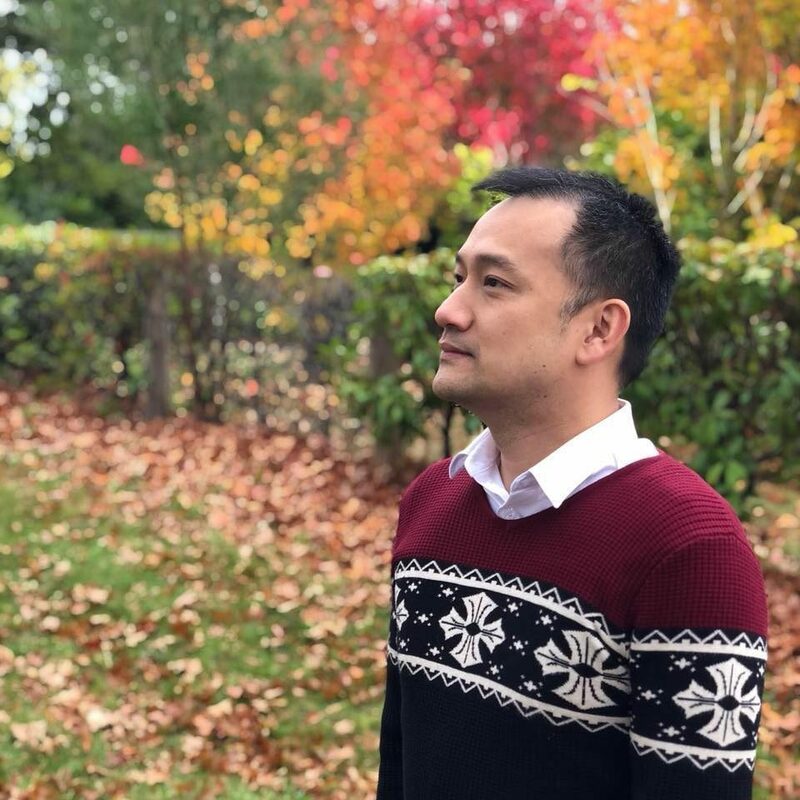 The sound quality of the calls is good too and the other end could always hear my voice well (thanks to the Dual-mic AudioIQ2 for background noise reduction), even when I spoke softly while walking in the middle of a peak-hour traffic. The team has also added an OpenMic™ feature which is enabled automatically when you press that Pause/Play button to pause the music. 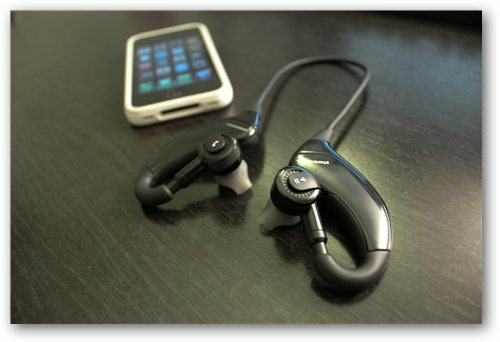 It allows you to hear your surroundings without removing the headphones. This way, you don’t ever need to take the BackBeat 903+ off your ears when you need to talk to someone near you or when you need to hear something important. The Plantronics BackBeat 903+ has been my best friend for these past couple of weeks on my way to work and it will be for times to come (at least until I have to review the next earphones piece). Normally, I found a nice Bluetooth headset to make/receive calls but it couldn’t be used to listen to music. Or often I got a nice set that can do both but it was not wireless. The Plantronics BackBeat 903+ truly combines the best of both worlds here. I use it every morning and every evening to listen to podcasts and to music. Sometimes a call comes in and with just a touch of a button, I can receive that call easily. The BackBeat 903+ also works well if you are using the voice activation commands in your mobile device. The sound quality is unbelievably good and crystal clear coming from the ear piece. It’s been a while since I can listen to a great music on earphones ever since my last piece broke. Most importantly, the Plantronics BackBeat 903+ is truly compact and stylish. Gone are the days of dangling silly cords and hard-to-store earphones. The BackBeat903+ is also a great piece to show off to those people on the street with earphones’ cords hanging around near their neck. Sometimes I purposely took off the BackBeat 903+ in an elevator and I could already feel the confusing stare/look at “the thing” I’m wearing. Very satisfying, indeed. The price is also affordable, considering the features that they pack into this piece. If you are looking for a new set of earphones or a Bluetooth headset to make/receive calls for this Christmas, the BackBeat 903+ is easily something that should be in your shopping basket. Next article3DMark 11 is out!